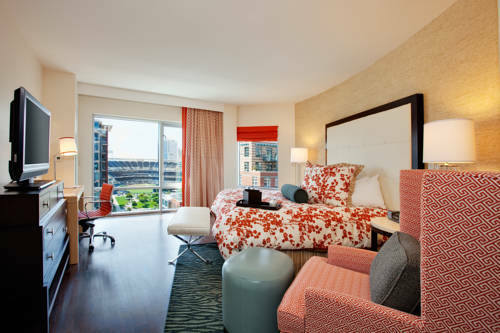 The Hotel Indigo San Diego Gaslamp Quarter hotel is at one with the neighborhood. Our award-winning, green hotel is LEED certified, with an eco-roof garden. Here, a perfect day might go something like this: visit the Gaslamp Quarter for great dining, music and boutiques, then take a trip to PetCo Park, where the Padres play. When the sun sets, enjoy cocktails and breathtaking views from our Level 9 Rooftop Bar, where fire pits keep things warm on cool nights. Our hotel is well known for its warm hospitality and inspired service, and is also enthusiastically pet friendly: we even have special packages that include Doggy Daycare. Zanzibar: Zanzibar Cafe is now open in the East Village neighborhood of Downtown San Diego. Please visit us for Breakfast, Lunch or Dinner or stop by our Gourmet Market for a delicious meal to go and to see our vast selection of gourmet products. PETCO ParkHome of the San Diego Padres. Gaslamp QuarterWalk over to San Diego's Historic Gaslamp Quarter and enjoy the many restaurants, bars and clubs. Great choices for different varieties of food in a quaint fun area of downtown. Legoland Californalocated in Carlsbad, Ca. Near outlets and the strawberry picking fields.